As co-founder and vice president of Renaissance, Whit Blanton discusses his transition, relocation and what his departure may mean for Renaissance. Cities are places to enjoy being in the presence of other people, creating with others, sharing ideas and transacting business. Those all depend on easy access and connectivity, comfortable and attractive public space and inviting gateways, which are key elements of Project DTO, Orlando's downtown vision and new redevelopment plan. A key part of the emerging Project DTO vision is of an "awesome outdoor city with highly connected neighborhoods and districts; a city with an iconic visual identity, built for the future so that open space supports recreation, air quality, tree canopy cover and water quality needs." Downtown Orlando's relationship with its lakes, a signature feature of the City Beautiful, is a centerpiece of that vision. Downtown Orlando's northern boundary offers a wonderful opportunity to support the vision. 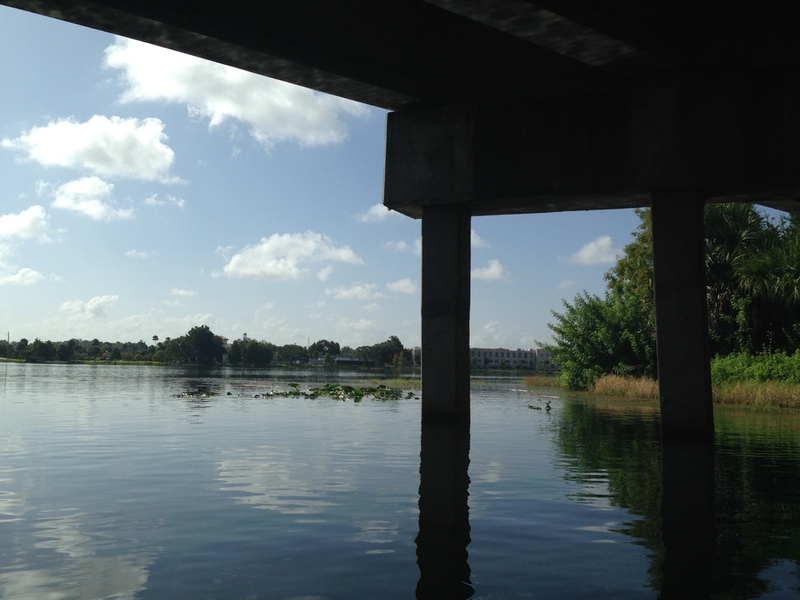 It lies along a series of small to mid-size man-made lakes, known collectively as Lake Ivanhoe, created for fill as part of the 1960 construction of I-4 from Lakeland through Orlando, and used for stormwater retention for most of the downtown basin. Interstate 4 bisects Lake Ivanhoe, bringing commuters and freight to and through Downtown Orlando. Across its tranquil shores lie the tidy neighborhoods of College Park, Orlando's 1920s and 30s first ring suburb, and Ivanhoe Village, a dynamic mixed use district of bungalow homes, industrial uses, warehouses, specialty retail, bars and restaurants along North Orange Avenue. Gaston Edwards Park, on the lake's eastern shore at the intersection of Virginia Drive and N. Orange Avenue, offers a boat launch, an Italian restaurant with outdoor dining, exercise trails, volleyball courts and a fishing pier. The boat launch at Gaston Edwards Park serves many types of users. The lake is in the Lake Jesup drainage basin, a part of the Middle St. Johns River Basin, drawing from some 16,000 acres in central Florida, from Lake Dot in Downtown Orlando to Lake Jesup in Seminole County. The basin, principally Lake Jesup itself, is trying to recover from decades of growth. Each rainfall flushes lawn fertilizers, motor oil and other contaminants into the streams and lakes, fostering undesirable, mucky sediments that degrade habitat quality and reduce sport fish populations. 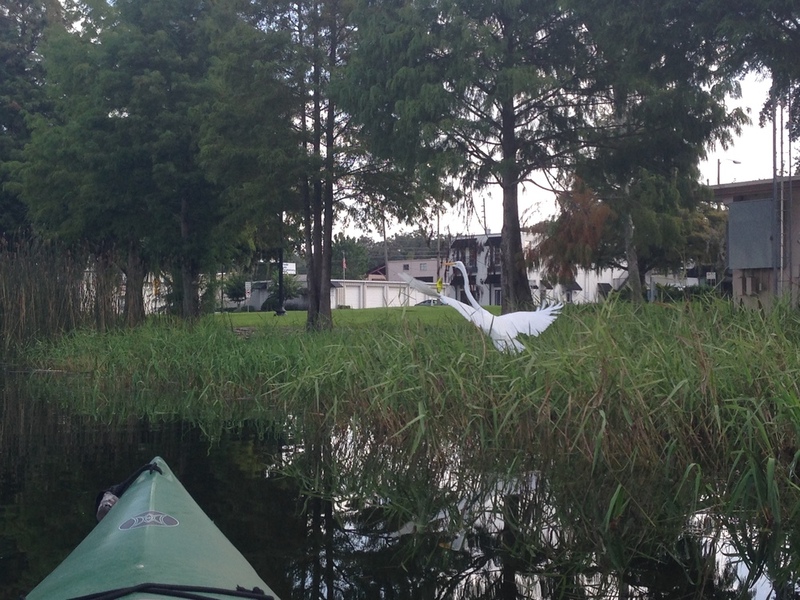 Efforts to restore Lake Jesup occur through the Lake Jesup Interagency Restoration Strategy, of which the City of Orlando is a participant to improve water quality through its Greenworks Orlando sustainability initiative. The turn on I-4 at Lake Ivanhoe is the first opportunity for southbound travelers to take in the full grandeur of Orlando's lakeshore skyline. Lake Ivanhoe also offers a scenic vista for those able to take the slower surface street routes, such as along North Orange Avenue linking Florida Hospital Orlando's Health Village and the Ivanhoe Village Main Street District with Downtown, or Edgewater Drive and Lakeview Avenue, connecting Orlando's venerable College Park neighborhood to downtown. Their confluence is at the mini Statue of Liberty, amid a sea of flowers. Gaston Edwards Park shimmers under a canopy of Live Oaks and other trees, a winding path offering convenience and comfort through the park to connect offices, hotels, antiques and restaurants. The historic Dr. Phillips Performing Arts Center building - a former OUC plant - is in dire need of a rehab. But Downtown Orlando's northern gateway could be so much more. The I-4 Ultimate makeover will offer some opportunity to brighten up the dark and dreary overpass above Lakeview Street, but it really feels like Downtown Orlando has turned its back on its front door. Letting a disjointed convergence of interstate highway ramps, one-way surface streets, discontinuous off-road paths, disconnected commercial buildings and impenetrable flora dominate the landscape hinders the creation of publicly accessible and visible space that could serve as an iconic gateway for Downtown Orlando. Stemming from mostly unintentional actions, there is a significant barrier to access and connectivity of adjacent northern neighborhoods to Downtown Orlando. The Ivanhoe off-ramp creates a visual and physical barrier to Downtown Orlando. Lilly pad flowers blooming adjacent to I-4. Expand Gaston Edwards Park to include a lakeshore beach and public swimming area.Bring back a prime public spot for beach blankets, wading, kayak launching and swimming, drawing people from surrounding neighborhoods. Perhaps Winter Park's Dinky Dock shoreline provides an example. Access from nearby hotels, residences and businesses would make this a popular draw. 2. Re-new efforts to create a shared use path around Lake Ivanhoe. This city initiative died about 10 years ago amid vociferous neighborhood opposition, but maybe it's time to try again. The linkage between College Park and Downtown Orlando is difficult at best, and the lack of well-defined and comfortable path around Lake Ivanhoe is a huge missed opportunity. A growing retail, jobs and entertainment destination on the east side of the lake is an increasing draw for residents of all parts of the city and visitors. Creating continuous linkages between neighborhoods, retail and downtown, with Orlando's Urban Trail as the spine, is critical for shared success. 3. Create interpretative wayfinding signage to convey habitat and resource information. Providing interactive visual and informative clues about natural character, distances to other destinations and a display of historic and cultural or artistic resources is the connectivity lubricant of a city. This could help create an emerald necklace among all Downtown Orlando parks and natural areas, from Lake Ivanhoe to Lake Eola, Lake Davis and Lake Lucerne. A Florida Snowy White Egret feeding among the shore grass. 4. 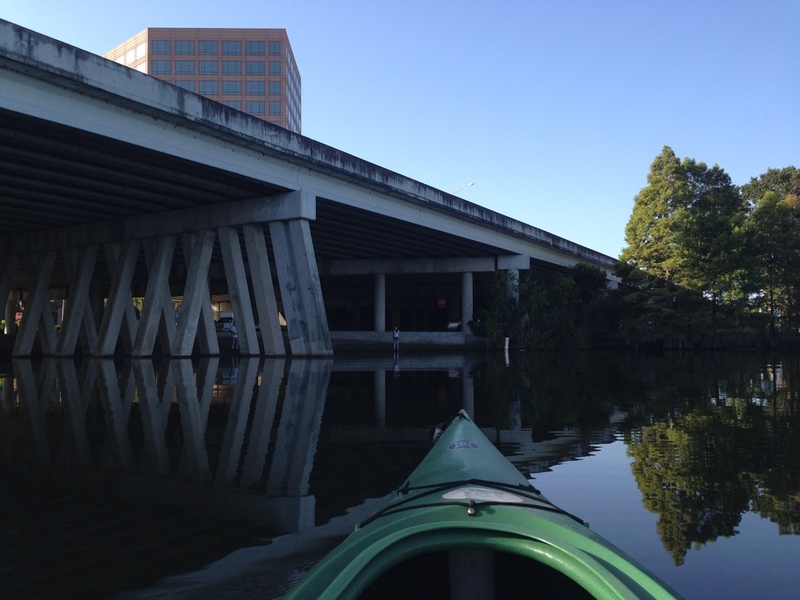 Establish public access/fishing areas underneath I-4 as part of the Ultimate I-4 makeover. A fishing pier underneath I-4 linked by a walking path would be amazing. Lake Ivanhoe is a stocked lake and part of Fish Orlando! intiative of Florida's Fish and Wildlife Conservation Commission. Walking/cycling paths to enable people to fish under the I-4 bridge, perhaps with a pier out into the lake, would add destination appeal. 5. Encourage and support events and festivals along the shore. Opportunities abound for surprise and delight. Acoustic concerts beneath gangly Live Oaks and Cypress trees at the water's edge; rehabbing and repurposing the Dr. Phillips Performing Arts building for performance and recording space; restaurants showcasing their menus with an "A Taste of Ivanhoe Village" event; water craft and ski shows on select days and times, and street parties on N. Orange Avenue between Ivanhoe Row and the lakeshore with the street closed could make this a more visible and attractive downtown destination. The future is beckoning. Let's make it happen, Orlando! A Sense of Place...From an Airport? In 2012, Hartsfield-Jackson Atlanta International Airport (say that five times fast) saw more than 95 million passengers walk into its jetways and through its hallways. Not only does this impressive statistic make it the busiest airport in the world in terms of number of passengers, it beat runner-up Beijing Capital International Airport by more than 13 million. Hartsfield-Jackson also ranks first in the world in terms of number of plane take-off and landings, with just more than 930,000 in 2012. Interestingly, Beijing is ranked sixth using this metric, likely due to a higher percentage of large planes carrying high numbers of passengers. But of those more than 95 million passengers entering Hartsfield-Jackson, how many of those people ever leave the airport? I lived in Atlanta for two years while studying city planning at Georgia Tech, and used the airport many times. Since moving from Atlanta in 2006, I would guess I've been back to Atlanta 40 or so times (thanks, Delta), but only three of those visits did I ever make it out of the airport. Because of my loyalty to Delta, it seems that almost every time I travel I end up coming and going through Atlanta. Located only ten miles from Downtown Atlanta, a great view of the skyline exists for flyers with a view to the north, yet I would bet the far majority are like me and rarely, if ever, make it those last ten miles. Instead, the sense of Atlanta flyers get is from the 6.8 million square foot airport on 4,700 acres bearing the name of two former mayors (William Berry Hartsfield and Maynard Jackson). Packed into the 6.8 million square feet, or 0.24 square miles, of space are more than 100 dining and drinking establishments and nearly 250 shops. Combined, there are more than 1,435 eating restaurants, bars and shops per square mile! Pretty impressive when you consider that there are 65 restaurants per square mile found in the Atlanta region as a whole. The airport also incorporates a mix of local brands and atmosphere to their offerings, giving visitors a sense that they really are in Atlanta. The City's commuter train system also serves the airport, with a MARTA station located right inside the airport for an easy connection to the City (it's shame so many people pass right by it). Speaking of airports reflecting the city they serve, McCarran Airport in Las Vegas most definitely feels like Vegas, with no shortage of slot machines to play while you wait for your flight. In October I'll be in five different airports within two weeks, and surprisingly none of those include Hartsfield-Jackson. Next month's Europe travels will lead me through Fort Lauderdale-Hollywood International Airport, Detroit Metropolitan Wayne County Airport, Amsterdam Airport Schiphol, Zurich Airport and Paris Charles De Gaulle Airport. As part of my travels across Europe, I'm going to focus on the airport, what stores they have, how they are laid out and how well they are integrated into the City's they serve. Stay tuned for my next blog post when I *hopefully* have lots of interesting observations to share. Harry Truman solved his problem. Seeking escape from the "White Prison" of Washington, D.C., he discovered the Little White House on Key West in 1946 as his oasis from the international post-WWII storms, political gamesmanship and scandal that roiled his first term as Roosevelt's successor. He never liked the White House and its trappings, and endured more than his fair share of criticism as president while making critical and accountable decisions during years of crisis. "If you want a friend in Washington," Truman was to have said, "get a dog." After his initial foray to Key West in 1946 for doctor-prescribed R&R, he spent 175 days there during his 2nd term, mostly working in the company of aides and dignitaries, with an occasional poker game with the boys and a fishing trip when his wife and daughter visited. Harry Truman understood the importance of down time. Between today's constant 24/7 pull of the Internet, social media, "breaking" news updates and demands for professional service and work deadlines, I find myself having a greater need for time spent alone, with family or in the company of friends in some type of public open space setting. The trouble is, it's getting harder to take the big two-week vacation, unplug and disconnect in some wonderful or remote setting. And the long, stressful days leading up to and immediately after that big event make it barely worthwhile. Rather, I've come to appreciate much more the snippets of time over a weekend or on a day here, half day there basis relaxing and recharging in some contemplative urban oasis amid dense foliage, rippling streams, walking paths and strong on-shore breezes perfectly made for contemplation. We often think of cities as great gathering places offering high levels of accessibility for people to interact and innovate by sharing ideas. But in addition to creating walkable, transit-oriented places, an important part of making cities livable is access to public parks and natural spaces. There is a growing body of research showing that public parks and open space reduce stress, improve health and contribute to economic prosperity of neighborhoods and local governments. While factors like distance and level of maintenance matter, a typical example is a recent study conducted in Greenville, SC, which found that small and medium parks have a positive influence on neighboring property values. This, in turn, can result in higher assessments and thus higher property tax revenues for local governments, potentially off-setting the capital and maintenance cost of greenways, parks and the like. It's certainly wise to try to monetize such benefits in this era of fiscal accountability, but let's not overlook the social and personal value of creating places for people to appreciate nature, get away from the constant marketing and the impersonal institutional surroundings of our daily lives. We all need our escapes. A short drive west from I-95 in Delray Beach, FL amid sprawling six-lane roads and gated suburban enclaves, you'll find The Morikami Museum and Japanese Gardens. Dedicated in 1975 and maintained by the Palm Beach County Parks and Recreation Department, the Morikami features 200 acres of scenic vistas, walking trails traversing six distinct sculpted natural gardens, and a fine Japanese café, museum and classrooms. The gardens provide ample places to stroll alongside streams or sit beside waterfalls and flowering tendrils of Firebush, Mexican Petunias and Alamanda. Like many suburban communities, Palm Beach County has been slow to recognize the importance and value of streets as livable places. As with all of Florida's big urban counties, roads are public places ceded primarily to the speed and efficiency of private automobile travel. Residential and even commercial land uses are generally hidden behind dense buffers of vegetation or walled and gated barriers designed to separate the impersonal public realm from private enclaves. Amid the sprawl and "thou shalt not" feeling of restricted public right-of-way and private gated communities, the Morikami and places like it provide a valuable and rewarding respite of communal open space designed to transport people away from the cacophony of traffic and commercial striving. While the Morikami is a "drive to" garden oasis that is a true regional and even statewide resource, urban open spaces ranging in size from pocket parks of a few hundred square feet to a few hundred acres improve livability and walkability. The Trust for Public Land has a nice report on "Shoehorn Parks," covering innovative strategies to squeeze green spaces out of crowded cities. My personal favorite is the use of cemeteries, which served as the principal open space in cities before parks as we know them today. Rooftops, school yards, stormwater channels and streets all can function as usable, enjoyable open space. The Key West Cemetery is an eclectic bit of history on 19 acres in the heart of Old Town built on the island's highest natural point. The cemetery dates to 1847 after a hurricane forced its reconstruction, and it includes markers commemorating the sinking of the battleship U.S.S. Maine in 1898 and graves of numerous other military veterans, as well as sections for Key West's Jewish, Catholic, Protestant and Cuban residents. Even on a hot day in mid-summer, a late morning stroll through the cemetery provides a peaceful and fascinating view into the lives of so many different people. These urban places, both big like the Morikami or small like the Key West Cemetery or neighborhood pocket parks, offer a welcome respite from the stress and anxiety of everyday life, making our communities more livable. Built in 1860, the Jupiter Inlet lighthouse sits on a natural 45' hill overlooking the Loxahatchee River inlet in Palm Beach County. The light has never failed to shine since its opening. The site is currently in use by the US Coast Guard, and is adjacent to Jupiter Lighthouse Park. Beautiful grounds and a nice museum, but it unfortunately lacks decent bicycle and pedestrian access. The site would also be more valuable if it offered canoe and kayak rentals with its prime access to the river. Great visit to a true treasure, but too many missed opportunities.